Miguel Martinez and Moses mug the camera for a photo recently at Brad Tolmans Young Ward farm. Moses the camel, used by local live nativity groups as a prop, has been discovered by movie makers. That’s right, he is becoming known as an actor in some local church movies. 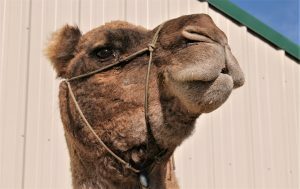 Moses the local celebrity camel owned by Brad Tolman of Young Ward has three sets of eyelids, and two rows of eyelashes to keep sand out of his eyes and the face of a movie star in the making. In many of the modern Book of Mormon and Bible videos being produced by the Church of Jesus Christ of Latter-day Saints, if there is a camel in the scene it is likely Moses. Camels are not as plentiful as horses or other livestock, the even-toed ungulates are hard to find in these parts. Sixteen years ago, Tolman traded a horse for Moses. He was just weaned from his mother when Tolman got him from his trading partner in Colorado. Horses have different reactions to the camel. It takes a while, for them to get use to him, Tolman said. Moses is dromedary, or one humped camel. A two humped camel is a Bactrian camel. Arabian camels like Moses have three sets of eyelids, and two rows of eyelashes to keep sand out of their eyes. He can also close off his nostrils during sandstorms in his native country. The hump on his back can store 80 pounds of fat, and he can go three weeks without eating or drinking. When he does finally drink, a thirsty camel can take in 30 gallons of water in 13 minutes. The hump on Moses’ back can store 80 pounds of fat, and he can go three weeks without eating or drinking. 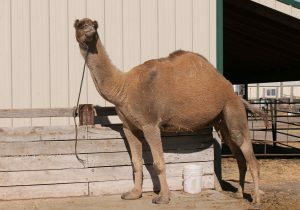 Brad Tolman, the came’s owner, said the camel confuse horses when they see him for the first time. Moses has been broke for riding, and the Tolmans have several different saddles for him. The camel makes the rounds during the Christmas season; he is scheduled for 15 nights in December. One of productions will be at the Nibley Live Nativity. It will be held at the historic Morgan Farm located at 2726 S. 800 W. in Nibley, December 7, 8 and 10. The Nibley live nativity features community volunteers dressed in period clothing, with animals that could have certainly been around at the time of the birth of Christ. Suggested donations are 10 cans of food or $15 a family, or three cans of food or $3 per person. Organizers of the event said you can bring whatever you can afford.